Manganese silicide is a candidate for low-cost thermoelectric materials with low-environmental load. MnSi1.73 compound was studied as a thermoelectric material available for thermoelectric power generation using waste heat. Manganese and silicon powders were mechanically alloyed under three different conditions (at 200 r.p.m. for 36 ks, at 400 r.p.m. for 3.6 ks and at 400 r.p.m. for 36 ks) with planetary ball milling equipment. Then, the mechanically alloyed powder was consolidated by a pulse discharge sintering process. Phases of MnSi1.73 (primary phase) and MnSi were synthesized by mechanical alloying and pulse discharge sintering. 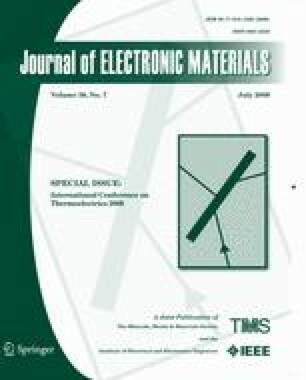 Thermoelectric properties were dependent on the mechanical alloying condition. The sample mechanically alloyed at 400 r.p.m. for 3.6 ks gave the best thermoelectric performance. The maximum dimensionless figure of merit ZT of 0.47 was achieved at 873 K.